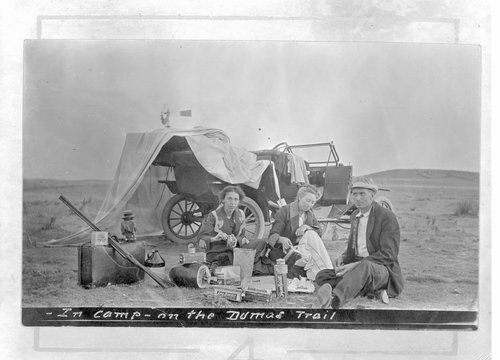 This black and white photograph shows a group of people camping beside their car on the Dumas trail, which may have been part of the Tascosa-Dodge City Trail. Tascosa, located near the Canadian River in Texas, was almost totally supplied by freighters from Dodge City, Kansas, carrying large amounts of supplies for the surrounding panhandle ranches. The trail was divided into two sections: the northern half through Kansas, which was already known as the the Jones and Plummer Trail; and the southern portion from Beaver, Oklahoma, to Tascosa. The trail started at Dodge City, went through the Oklahoma panhandle and into Texas. The trail continued southwest to the Little Blue stage stand, which was located just south of Dumas, Texas. Here, the trail branched. The northern branch led to Tascosa by way of Hartley County; the southern branch hit Tascosa after turning south and then west through Potter County. Overall, the route from Dodge City to Tascosa covered around 240 miles.